A Bedfordshire dealer open day, combined with a moisture meter testing clinic, was very well attended. David Williams was there. Claas main dealer Oliver Agriculture Ltd and JCB and Challenger main dealer, and sister company Oliver Landpower Ltd, staged the open day at its Wandon End, Beds headquarters in mid-April. Farmers and contractors in the area were well up to date with field work and made the most of the opportunity to get their annual meter checks completed and to view the latest equipment on offer. The 2015 event followed a similar formula to the company’s previous 15 successful and popular annual open days. The dealer has three depots; Wandon End and Bicester, Oxfordshire from which both the Landpower and Agriculture divisions operate and Kings Langley, Herts, which includes just the Landpower business. Customers are looked after across the local areas as well as further afield. A wide range of machinery franchises are represented including Sumo; Lemken; McConnel; Amazone; Hardi; Teagle; Twose; Larrington Trailers; Kawasaki; Logic; Strimech and Topcon, along with Isuzu trucks from Oliver Landpower. While an equally comprehensive line-up is available from the Agriculture division which includes Great Plains; Horsch; Maschio; KRM; Cherry Products; Reco, Cousins; Richard Western; Opico; Dowdeswell; Knight; Kramer; Sulky and Martin Lishman. Representatives and specialists from many of the brands were on-site to assist Olivers’ staff in dealing with customer enquiries. Combined with the open day was a Martin Lishman Moisture Meter Grain Clinic, one of 30 organised by the company in various UK locations between January and June. The clinics allow visitors to bring along their moisture meters for testing and calibration, at a fixed cost of #11 per unit which includes a calibration certificate which can be used for quality assurance purposes. Specialists are present to advise users on correct technique and any make of meter can be brought for testing. In the event of failure, the meters can be submitted to Martin Lishman for repair or replacements can be purchased including the company’s own brand; Field Check, as well as Protimeter models. Oliver Agriculture sales director David Jarman hailed the day a great success with well over 300 visitors. “Holding an open day is a fantastic opportunity to catch up with new and existing customers, in a relaxed and friendly atmosphere where their future needs can be discussed. Interest was strong in all product areas with many enquiries and several orders taken on the day. This annual event has grown considerably since we restructured our trading businesses in 2008,” he said. The Isuzu vehicle franchise was taken on by the Landpower division in September 2013. “It didn’t clash with anything we were doing already and we were aware that 30 per cent of all Isuzu trucks are sold into agricultural situations,” explained Oliver Landpower sales director Charlie Glenister. “We have had considerable success already, supplying our existing customers, but also gaining new ones within other industries, such as the building trade. We sold 55 pick-ups in our first year which was pleasing and the standard five-year or 125,000-mile warranty is reassuring to buyers. Fuel economy is superb and the 3.5t towing capacity is just what is needed. The range ticks all the boxes,” he added. Mark Cooper of Henlow, Beds-based AS & JS Cooper is pictured with a Claas tedder similar to one operated on his family farm. The mixed arable and beef unit includes approximately 80ha (200 acres) of crops and a 400-head Aberdeen Angus and Hereford cattle herd, producing beef for Waitrose. “I have always been an Oliver customer and use two JCB telescopic handlers, a Claas 640 Arion tractor, a Claas combine and a rake tedder and mower,” he said. The Arion is used mainly for haulage tasks and with a diet feeder, its 50kph transmission and cab and front axle suspension making it ideal for the large amount of transport work necessary explained Mark. “It is a CIS-specification, equipped with the Hexashift transmission, and we bought it following a demonstration as the operator was keen. It has a good warranty package too, which is reassuring, but we have had it for approximately a year and it has been very good. Our previous tractor was five years old, of a different brand and with a basic gearbox, so the Claas with its 24×24 shuttle transmission and its 1,000rpm Eco PTO operates the diet feeder much more efficiently. Our Claas mower and rake are both under three years old and the 9m tedder was bought last year and performs well. We have a separate business producing hay and silage for equine use so we need up to date, reliable kit and the Claas machines are ideal.”The back-up from Claas and Olivers is very good and we run a Claas combine which is quite elderly, but we can always get hold of parts when needed and the service staff are always available,” he added.Mark was also taking advantage of the Martin Lishman moisture meter clinic. “I bring it along every year. It is convenient and much easier than having to send it away for checking, and I receive the certificate too,” he explained. Pictured enjoying refreshments on offer at the open day are (l-r) Olivia Whitaker, Sam Bacon and James Bacon. 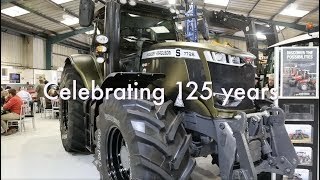 Sam and James were at the event looking at Claas tractors as their contracting business; Acorn Services Herts Ltd, which specialises in silage operations and muck spreading, is in need of a larger model to replace its current Claas tractor. Cultivations equipment to tackle the black-grass problem featured within the Dal-Bo display area. “Dal-Bo is our fastest growing franchise and we sold many machines from the range during the past year,” explained Oliver Agriculture sales manager William Helliwell. “We receive excellent support from Steve Atkin and his team and many of our sales have been the result of referral, as neighbouring farmers have recommended the products, resulting in requests for demonstrations and sales. “We are delighted with the increased sales in the area,” added Steve. “Features such as the paddles available for our rolls are in demand as they provide a level finish when rolling ploughed land, and are great for freshening up the surface. The dealer team supplies equipment from across our range, but mainly seedbed cultivators and the rolls, with 12, 15 and 16m sets in highest demand as well as 8m versions with paddles.”Dal-Bo UK sales manager Steve Atkin is pictured (left) with William Helliwell. The Martin Lishman Grain Clinic was well attended throughout the day with farmers and growers taking advantage of the opportunity to have their meters tested. Developed in the UK to assist in the fight against black-grass is the Opico Micro-Pro 16 Avadex applicator. Since its first showing at Lamma in January, it is now available to order and is receiving high levels of interest, explained the Opico team. It has a 12m application width and uses a hydraulic-driven fan to distribute the herbicide through its application booms across the distribution outlets. Designed to be mounted on a 3-point linkage it is priced at 13,931 and was attracting considerable interest. “Black-grass is foremost in many farmers’ minds,” explained Opico area sales manager Glenn Bootman. Pictured (l-r) are the Opico team at the open day; Glenn, Maschio specialist David Day, Maschio key account manager Carlo Facchini and Opico sales representative for the west of the UK, John Hulland. Watton-at-Stone, Hertfordshire-based Bluebury Contractors Ltd partners David Sworder (left) and Mike Smith (right) are pictured with Oliver Group chairman John Humphreys. The farming and contracting business offers its services to farmers in the area, its mainly arable operations totalling 1,820ha (4,500 acres) on a mix of rented and contract-farmed land. Cropping is mainly cereals with some grass, and much of the work is stubble to stubble crop management and the business also specialises in borage swathing and forestry work. Two Challenger crawlers; an 855C and a 765C are operated and drilling is carried out using two Horsch drills, a 4 and 8m. The business also operates a JCB loader. The two Challengers carry out all the heavy cultivations tasks as well as the drilling and a new mole drainer has recently been purchased for the larger machine, and is due to start work on fallow land shortly. “We have been dealing with Olivers since the business started more than 50 years ago,” said Mike. “It is a good family firm and we always feel welcome when we call in for anything. Customers are treated well and the phone is always answered, no matter when we call. When problems do occur there is never any attempt by anyone to run away from the problem and the relationship has become very easy.” One of the latest acquisitions by the business has been a new high specification Amazone ZA-TS fertiliser spreader. “We bought it earlier this year and it has already applied fertiliser to more than 4,040ha (10,000 acres),” explained David. We run it through an iPad linked to the Amatron 3 control box to achieve variable rate applications and it has proved a wonderful machine. It has variable spread width control for headland operation, and it has been spot-on. John Barnett, Oliver’s Amazone specialist has been such a great help, and as it was the first of this type that he has worked with he has been learning with me and I am very impressed with his enthusiasm. Fertiliser is expensive and being able to apply it precisely where needed in the required quantities using the new spreader is a real benefit,” he added. Pictured (l-r) Oliver Landpower sales director Charlie Glenister, with members of the Luton sales team; Kevin Ludgate, Adrian Hewis and Michael Payne. Trading as Alistair G Clark and farming at Kimpton, Herts, Alistair (right) and main machinery operator Adam Hills are pictured at the event. Approximately 260ha (650 acres) are farmed by the business, and cropping is mainly cereals but there is also a small livery enterprise and a general agricultural contracting service is offered, including harvesting of combinable crops. “This is the second generation of my family dealing with this depot and we tend to buy most of our machinery from the dealer. In the past Olivers had different brands to offer, but when they took on different franchises we followed them, as the service is so good and we enjoy such a good relationship with the staff. It is no good operating the best machinery in the world if there is no back-up in the event of problems, so the dealer is our main priority when choosing equipment.”Recent purchases include a Claas 650 Arion with Hexashift transmission and other machines bought through the dealer include the farm’s Claas Tucano 430 combine, new in 2011 and the fifth Claas operated by the farm since it purchased its first of the brand; a Senator bought in 1980. “We get on well with Claas combines and they have all been reliable despite being well used while we own them,” he added. The farm’s plough, cultivators and sprayer as well as a JCB 526-55 telescopic handler, new in 2010, were all bought through the dealer. “We are looked after well by the whole team, but tend to deal mainly with Rex Hedges and David Jarman. They are all very good,” he said. “We are very pleased with the attendance at the open day,” said William Helliwell. “Farmers are up to date so are taking time out to have a look at what is new and discuss their requirements with our staff. The weather has been excellent in recent weeks and crops which were struggling have largely caught up, except the grassland, which is a bit behind still. We seem to be bucking the general trend within the industry, as our sales are similar to last year. 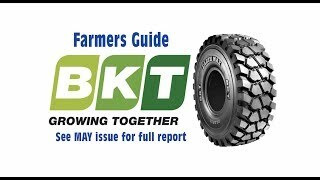 Our tractor sales are increasing, we are busy on products such as the Dal-Bo rolls and our other cultivation products from Great Plains and Horsch are all in demand. The Great Plains X-Press cultivator is proving popular, along with the CultiPress for heavier land farmers in Bedfordshire and Herts. The Horsch Sprinter drill and Tiger cultivator are selling well, and we are looking forward to an autumn demonstration campaign during which we will be allowing farmers to find out for themselves just how effective the Horsch Joker and Pronto machines are.”Our main brand, Claas, is proving exceptionally popular, the latest tractors, handlers, combines and green harvest products providing users with the best range we have ever been able to offer, which has led to a great increase in sales,” he added. Pictured (l-r) are William Helliwell, David Jarman, Rex Hedges and Paul Green. Oliver Landpower and Agriculture customer JPF Waddup of Coldharbour Farm, Hatfield, Herts has recently ordered new JCB and Claas telescopic handlers. Farming just under 400ha (1,000 acres) between three units the farm is mixed, with arable crops as well as grass, sold as haylage, for equine use. “We deal equally with both sides of the business,” explained Jeremy Waddup, and recent purchases have included a 6m Amazone drill, bought six months ago and a new Larrington trailer last year. We have recently purchased a Great Plains cultivator and McHale bale wrappers too. The service is very good from everyone here.”Explaining the decision to buy both makes of handler, Jeremy commented that a JCB was operated previously along with several tractor loaders but the decision had been made to move away from the tractors for materials handling, replacing them with a second telescopic handler. The JCB had been very successful, so the decision was made to replace it with another of similar specification, following a successful demonstration of one of the latest models with an improved and updated design. While considering options for the second machine, the farm’s Oliver Agriculture sales representative, Paul Green, had lent the farm a demonstration Claas Scorpion to try, resulting in the purchase of a new 7055 7m 5.5t capacity model, to be used for grain and bale handling as well as bale haulage on the road. “We very much like the hydrostatic transmission and the Deluxe cab option is very comfortable, with all the controls falling easily to hand,” explained main operator Michael Waddup. Having all the functions for the boom and transmission on the main joystick is really convenient. We spend long working hours in the machines and need something which won’t be tiring to operate,” he added. Pictured (l-r) from JPF Waddup are; Adrian Jarvis, Jeremy Waddup, Glen Gear, Michael Waddup and Oliver Agriculture salesman Paul Green.